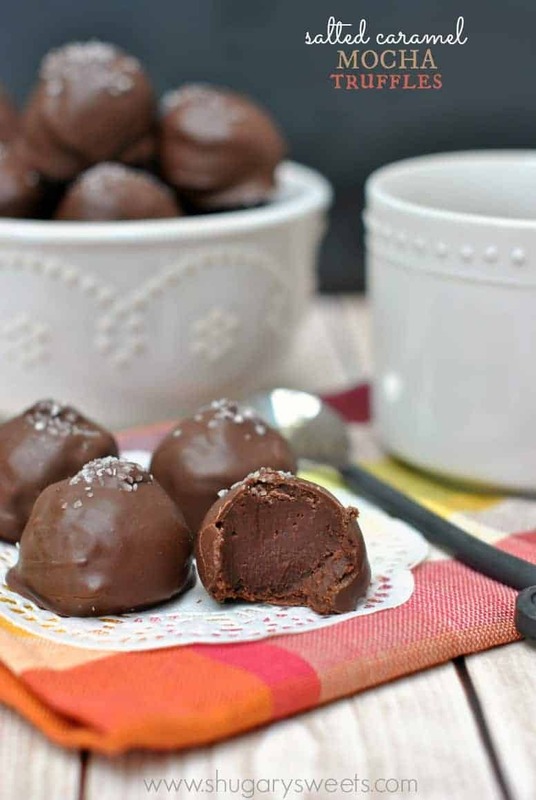 These Salted Caramel Mocha truffles are indeed better than any store bought chocolate. The soft center with the crunch of chocolate, oh my, how can you resist? As much of an addict I am for a hot cup of coffee, I’ll be honest…I don’t visit Starbucks often. If I’m on a road trip…yes. Necessity. But in my day to day, routine life, Starbucks doesn’t fit it. When I want a hot cup of coffee, it’s because I want to be sitting on my couch with my feet curled up under a blanket, reading a book. Last week was crazy hectic. Actually this month is crazy…and I’m loving every minute of it. Except for the part where we paid for our eye doctor’s vacation. No seriously, I’m pretty sure he will be going on a nice vacay this fall thanks to my family. Between me getting new contacts, and my 4 kids eye visits (two of whom need glasses) we spent a huge chunk of change. And on my way home from the final eye visit of the week (cause of course I couldn’t get everyone on the same day….) I splurged on a Salted Caramel Mocha from Starbucks. Every season I enjoy having the new flavors, once. And for some reason I am on a HUGE Salted Caramel kick. I know I’m late in the game on this one. I get it. And if you follow me on instagram you’ll know I have my own salted caramel treats coming to the blog this fall. Starting with today’s Salted Caramel Mocha Truffles. I’m back at it over at Food Fanatic, as the candy contributor, sharing these lovely treats. And trust me when I say, you want this in your life. Yesterday. It’s like a salted caramel mocha in candy form. Wait it IS just that. So enjoy! Looking for more Truffles? Fudge? Candy? Be sure to follow my Pinterest Board!! 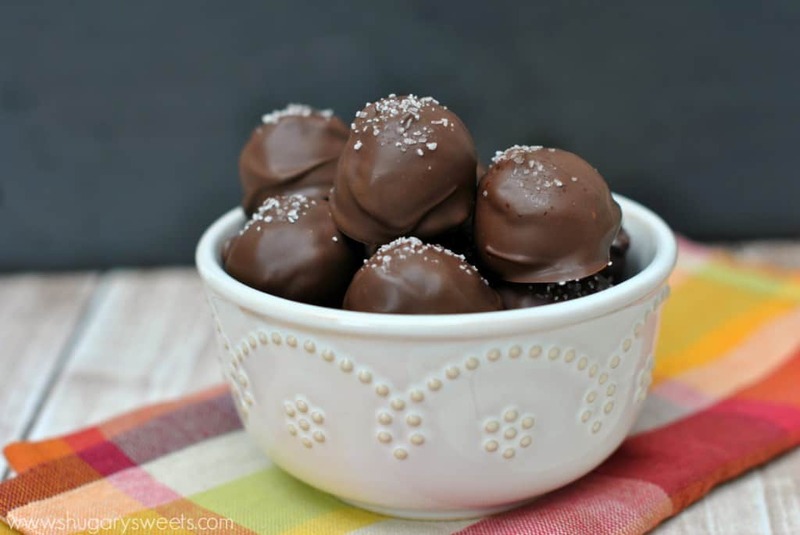 Follow Shugary Sweets’s board Fudge, Truffles and Candy on Pinterest. And the eye doctor, ouch. Isn’t it amazing how much you can spend going to the doctor and that’s even WITH insurance. My daughter’s broken arm from this spring seriously is costing me the equivalent of a decent car. I hope your daughter’s arm is all healed up. We dealt with a broken wrist for over 3 months last summer. Cha-ching! Oooh, these look awesome! And it totally reminded me that I haven’t had my first Salted Caramel Mocha yet this year! You better run to Starbuck’s quick 🙂 Thanks for the pin Amanda!! Oh man, these look delicious. I am a chocolate fiend. These wouldn’t last long at my house! Oooh, I like that idea. With!! Ugh. Doctors!! So expensive. Truffles? AMAZING! Oooh, these look so special. I love that fudgy center! And with mocha. Wow. Next time you hit Starbucks, buy a salted caramel cake pop and freeze it. It’s really good frozen. But probably not as good as these! I love love salted caramel and the salted caramel mocha – adore!! These truffles are happening soon! Best way to relax after a costly appointment! Pinned! Ouch….I hear you about the eye doctor visits! These look like some amazing truffles, though! I LUUUUUV the flavors you’ve got going on in these truffles Aimee! I can’t wait to try this recipe. I know my whole family will love it! I am swooning over these truffles. That fudgy center is the best! It’s crazy the amount of cash we have to spend on the things we NEED. I think we are in the wrong career field, lol. I am with ya…how can you turn down salted caramel?! i would never turn this down. Never! Yum! I love anything salted caramel. I love truffles…and salt… and espresso… having a serious craving for one of these now! I’ll take 20. Wait! Make that 50! These look divine! Totally agreed girl, coffee at home in your pjs is the best kind. 🙂 Then it just feels special when you do get a starbucks when your out too! 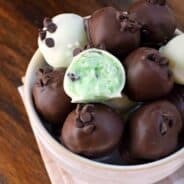 These truffles look and sound amazing! Love the salted caramel flavors, its my weak spot! Pinned this and totally trying! Yum!! I want one now!! Ok… a dozen. What are caramel bits tho’? They are made by Kraft, in a bag in the baking aisle (sometimes in the candy aisle). If you can’t find them, you can use regular caramels. Reece wears glasses and I’m thinking Bryce made need them too…hold me! Oh truffles! You make the best ones Aimee! 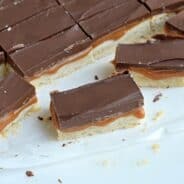 These look divine and I’m totally with you on salted caramel – it’s amazing! Pinned! I have been avoiding the eye doctor for that very reason, but I think it’s time to get the kids in again. Goodbye paycheck!! I’m going to need a venti coffee after that day too! These truffles are seriously amazing…I love how creamy the center is! Salted caramel gets me every.single.time!!!! What is a caramel bit? oops, sorry, just read the question from someone else, above. Please delete my question! I didn’t realize ghirardelli made melting chocolate, I’ll have to look again, I can’t wait to make these. I feel like doctors offices should offer complimentary Starbucks drinks. Goodness knows we all need one after a visit! Salted caramel mochas are amazing, I can only imagine what biting into a fudgy truffle would be like! What a fun finger food dessert! You are rockin’ my world with these! So incredible! 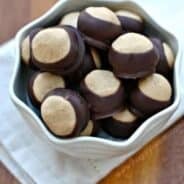 Has anyone tried these dipped in dark chocolate instead of milk chocolate? Thoughts? I’m sure dark chocolate would be delicious paired with the espresso and caramel!! I don’t get caramel bits where I live. So, can I substitute home made caramel or dulce de leche for the bits. And how much will I need to add? Thanks, I can’t wait to make these!